Lestremiinae (wood midges) are a group of finy forest-dwelling dipterans with a world-wide distribution. The present inventory, coupled with a taxonomic revision, documents of occurrence of 230 species, 28 genera and 9 tribes of Lestremiinae in Fennoscandia and Denmark. Species-based information on distribution and phenology is provided and the biogeographic patterns identified are discussed. Diagnoses, illustrations and keys facilitate the identification of species (adults). An illustrated key makes the identification of all the supraspecific taxa known from the Holarctic region possible. Sixty new synonyms and 12 new combinations are proposed, and 1 new genus and 56 new species are described. The adult morphology of Lestremiinae is outlined and re-examined in the context of phylogeny and classification. Evidence is supplied that the Lestremiinae are a paraphyletic assemblage. A proposal for a natural system of the Cecidomyiidae (gall midges), including Lestremiinae, is presented. The systematic position of the Cecidomyiidae in relation to the Sciaroidea is briefly discussed. The study of the taxonomy of Holarctic and Fennoscandian Lestremiinae is outlined in a historical context. 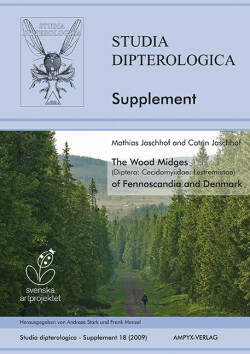 The methods of studying adult wood midges are explained.